The Scotiabank Mobile Banking app makes it easy to manage your accounts, make payments, transfer funds, and more, all from your iOS device. • Deposit CAD and USD cheques in minutes using Mobile Deposit. • Stay on top of your account activity with Scotia InfoAlerts. • Login with Touch ID and view your Quick Balances from your iPhone’s Today screen or on Apple Watch. 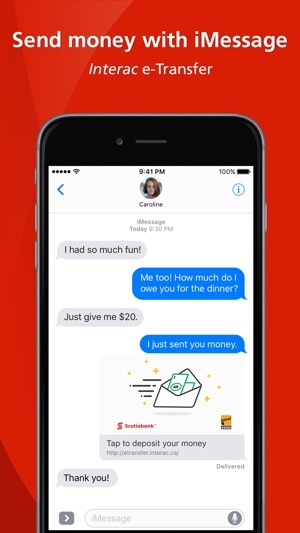 • Transfer money to friends and family in an instant using iMessage. 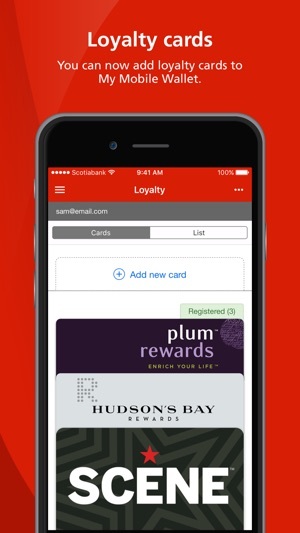 • Pay on-the-go with Apple Pay and eligible Scotiabank debit, credit, or prepaid cards. 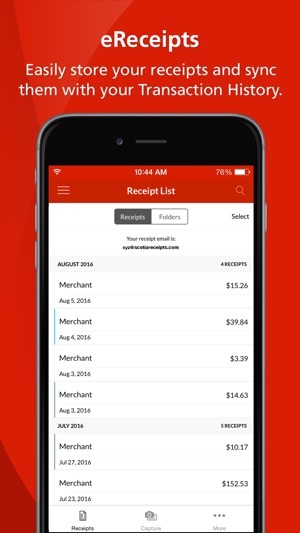 • Digitize and store paper receipts with eReceipts and sync them with your transaction history. • Set up travel notifications to avoid disruptions and protect your accounts while you’re away. • Send money to anyone, anywhere with Interac e-Transfers in Canada and Western Union Money Transfers around the world. 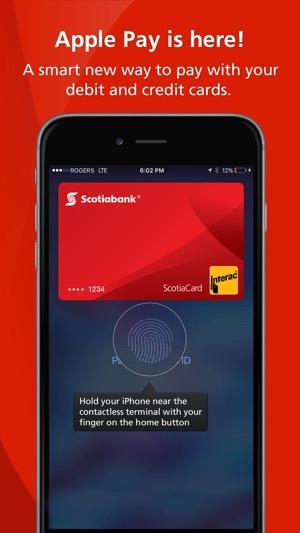 • By pressing the button, downloading the Scotiabank mobile banking app published by The Bank of Nova Scotia, or setting up your device to do so automatically, you consent to the installation of this app, its future updates and upgrades. You can withdraw your consent at any time by deleting the app. • If you enable Location services for our app, we’ll use this information to provide you with maps of services available in your area. • If you enable Travel Reminders, we will note the last country where you used our app and remind you to create a credit card travel notification when you change countries. • If you enable Contacts, we’ll use this information to populate e-Transfer recipient information. • If you enable eReceipts, we’ll require access to your camera. • When you use Scotiabank’s Mobile Deposit feature, we will access your device camera to take a picture of your cheque; record the cheque number, account number, institution transit number, and amount; record your device model, as well as its iOS version and manufacturer. When you download or update this app or when you apply for, enroll in or use a Service via mobile banking, we may collect information about your computer or device, operating system, internet connection or telephone account, settings, IP address and device locational data, and transaction data, as well as personal information. We may collect, use, disclose and retain this information as set out in the Scotiabank Privacy Agreement ( http://www.scotiabank.com/ca/en/0,,351,00.html) and to determine which settings are appropriate for your computer system, to provide or enhance digital functionality and banking options, and for security purposes, internal analysis and reporting. You may withhold consent to the collection, use and disclosure of this information, although this may prevent you from using the digital channel to apply for or use a Service, to communicate with us, or may reduce the functionality of that channel. Contact us at 1-800-472-6842 (Canada/USA) or +14162883899 if you need support, or for help uninstalling our app. 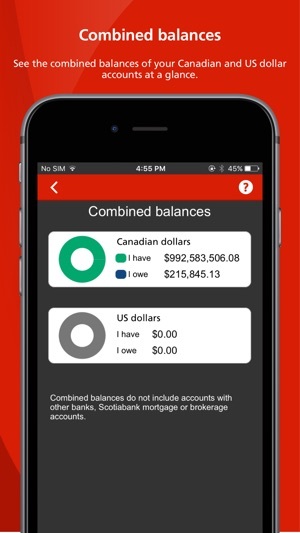 This app gives access to Scotiabank accounts held in Canada. For information about our services in other countries, visit www.scotiabank.com. We've tuned up our app and fixed some minor bugs. The last two updates have not allowed me to sign in. The wheel just spins and spins and spins. Please fix this, the app is useless right now. Poor UI , design. I deal with rbc too and if we compare these too . I will give this -2 . Need to step up Scotiabank . And who charge for interac transfer nowadays and also can't even transfer money to different person who uses same bank . I guess they wanna make money from interac transfer . It worked fine but now just spins and spins when I try to sign in. So annoying.